I must admit that I hadn't heard of Cecil Beaton before, but this probably just shows how little I know. There is a stunning quality in his portraits that I can't quite identify, but it is immediately captivating. The composition is outstanding and the lighting is perfect (obviously!) There's a quiet and wonderful relationship between the charm of the subject and the imprint of Beaton's personal creativity. The portraits become a composite of both photographer and sitter, which is something I completely admire. I feel with this exhibition, however, people are more likely to be drawn to the images of the big Hollywood celebrities. Beaton's image of Audrey Hepburn was blown up to a gargantuan size, the only reason for which, as far as I can tell, is to comfort those visitors less engaged with art and photography by saying, "Hey, don't worry, you know who this face is without having to read the sign!". I'm not exactly a fan of Audrey Hepburn, so this was lost on me. I must admit that I did enjoy the pictures of Marilyn Monroe, and I've since found out that these were her favourite photographs of herself. That's rather a testament to his talent, I would say. 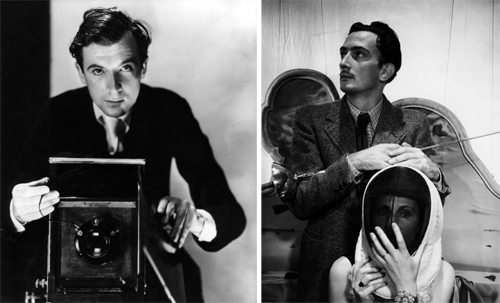 My personal favourites, however, were Beaton's Self Portrait & Salvador & Gala Dali. I've entered a competition to be made up like Marilyn Monroe and photographed in the Beaton style to be displayed at the gallery. Fingers crossed! When we left, I had the distinct impression that Art History is the right degree for me. I can't imagine a life in which I am not seeing, writing, or thinking about art. The Beaton exhibition has even inspired me to dabble in black and white portrait photography myself. I'm going to start looking at dSLRS.